Smoked beers are something of an acquired taste, particularly those made by the famous German Brewery Schlenkerla, who's output is almost entirely made up of smoked beers (technically their helles lager contains no smoked malt, but as it's brewed on the same kit it still has a smokey edge). The beers are a shock to the senses on the first try, as they taste intensely smokey and quite savoury too, which creates a kind of smokey bacon effect, or as I think is closer to the mark, smoked German sausage. But as well as beers like the Schlenkerlas which place smoke front and centre, there are lots of brewers both sides of the Atlantic using smoked malt in a more subtle way, adding it to porters or other beers to give an extra dimension to the roasted malt flavours. I can safely say that at this time of year when the weather is freezing cold and I'm inside defrosting my bones, these are the kinds of beers I'll be reaching for. 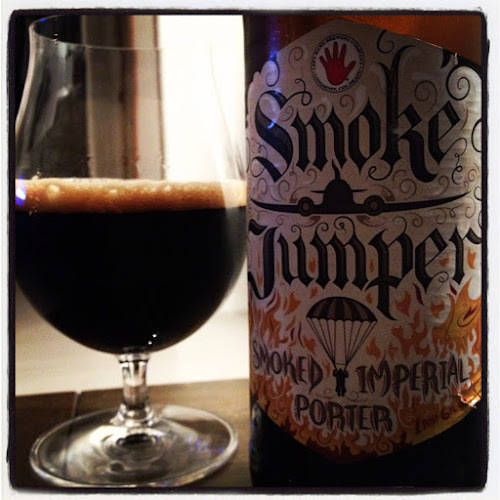 And it was as such I found myself cracking open another bottle from my now quickly diminishing New York haul, Left Hand Brewery Smoke Jumper Imperial Smoked Porter. Originally brewed in 2008 to much praise, it beat off the likes of Alaskan Smoked Porter to win at the GABF, Lefthand then didn't brew it again until this year. Apparently bringing it back due to popular demand, which for once I can actually believe having tasted the beer. This pours a viscous pitch black with an off white frothy, milky head that sticks around. The smell is sweet fresh tobacco, smokey bacon, coffee, a bit of booze and dry stout-like roasted malt. The taste is initially very smokey, with a real sweet and savoury BBQ flavour where sweet malt and smokey bacon bounce off each other and fool your taste buds. Once your palate adjusts and you push past the smokiness you get some sweet roasted malt and an earthy, spicy bitterness with a nicely balanced, medium bitter finish. As much as its a big flavoursome beer, it's also really well balanced and very drinkable. Some bombers at this strength I open and struggle through to the end because of their intensity or bitterness, I'm looking at you Stone Imperial Stout, but this is a pleasure to drink from start to finish. I enjoyed the bottle of this I shared with some brummy beery types a few weeks ago.